Macrino d Alba (Gian Giacomo de Alladio), Italian painter. Inscriptions on his altarpieces indicate he was born in Alba. He probably trained elsewhere; his early works, with the exception of the portrait of Andrea Novelli, Bishop of Alba (Isola Bella, Museo Borromeo), cannot be traced to a precise location. His patrons were mainly from the Paleologo court at Casale Monferrato, where he was the official painter. 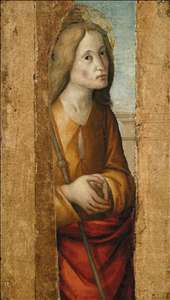 His earliest signed and dated work is the triptych of the Virgin Enthroned between SS John the Evangelist, James the Greater, John the Baptist and Thomas Aquinas and Two Donors (1495; Turin, Museo Civico d Arte Antica), and it and the Virgin and Child between SS Nicholas and Martin (Rome, Pinacoteca Capitolina) show the influence of Lombard painters, particularly Ambrogio Bergognone; some writers have suggested that this may indicate a journey through central Italy, perhaps to Rome. Macrino d Alba worked mainly in the city of Alba but his paintings can be found in Turin, Rome, and in the Certosa in Pavia. See more details about "Figure of a Saint"